BERLIN (Reuters) - The corruption scandal engulfing soccer's world governing body FIFA is not tarnishing the image of its long-standing sponsor Adidas, the chief executive of the German sportswear company said on Thursday. Adidas said its sales of soccer products rose 19 percent in the third quarter, helped by the launch of new "ACE" and "X" soccer boots and kits for new partners Manchester United and Italian champions Juventus. "The image for our products have never been better so I am definitely convinced that the consumers clearly differentiates between us as a company and the brand and what's going on in FIFA," Herbert Hainer told a conference call for journalists. Adidas has provided the World Cup match ball since 1970 and extended its partnership with FIFA until 2030 two years ago. The company faced criticism last month after declining to join other major sponsors and demand the immediate departure of FIFA President Sepp Blatter after Swiss authorities opened a criminal investigation into him. Blatter has denied any wrongdoing. FIFA's ethics committee last month suspended him for 90 days along with UEFA president Michel Platini, previously considered the favorite to take over from Blatter. 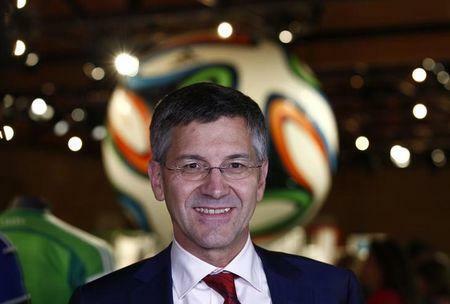 Hainer said Adidas had called for FIFA reform even before last year's World Cup in Brazil and said he had confidence in the ethics committee to make FIFA more transparent, adding that Adidas was in "constant dialogue" with FIFA and the committee. Hainer said Adidas was not part of a scandal involving a payment to FIFA by the German Football Association (DFB), but added he expected the DFB, which Adidas sponsors, to do all it could to clear up the matter. Police and tax investigators raided the headquarters of the DFB on Tuesday to investigate suspected tax evasion linked to the hosting of the 2006 World Cup in Germany. At the heart of the investigation is a 6.7 million euro payment from the DFB to FIFA that Der Spiegel magazine said was a return on a loan from the then Adidas CEO Robert Louis-Dreyfus to help buy votes for Germany's World Cup bid in 2000. "This doesn't have anything to do with Adidas as Dreyfus gave money when he had already left the company. It was his private money," Hainer said. Hainer also expressed support for embattled DFB chief Wolfgang Niersbach and Platini: "Both have done very good jobs for their organisations," he said. Both the DFB and Niersbach have rejected the votes-for-cash claims made by Der Spiegel.